Holy Trinity Barkingside Parish Church is on the southern side of Mossford Green, a little westwards of the Underground station. 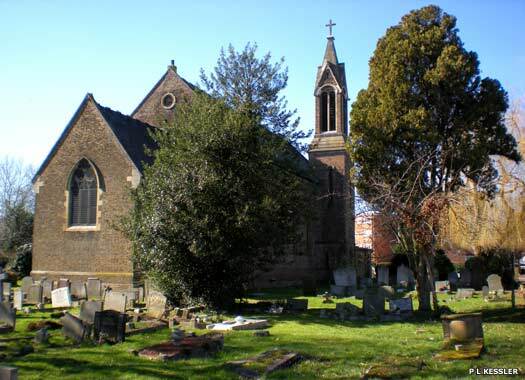 The impetus for a new parish church here began in 1838, when a petition was sent to the Church Building Commissioners by the inhabitants of Ilford, stating that the people of Barkingside were 'very destitute and degraded' and in need of a church. The only place of worship in the district was the private chapel at Aldborough Hatch. A site was given by the owners of Gayshams Hall and the building was completed in 1840. 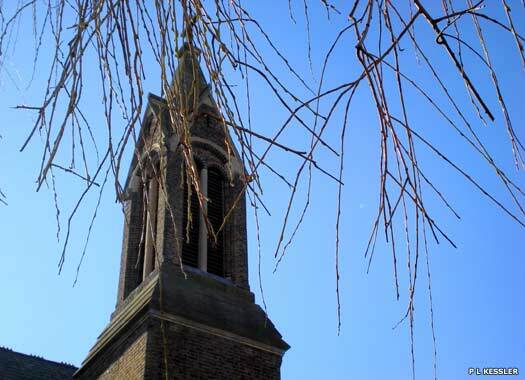 The following year, Barkingside became a district chapelry. The church, which stands in a graveyard, was designed by Edward Blore. It is a yellow-brick 'Norman' style building consisting of a nave and a north-west porch forming the base of a small tower with a graceful spire. The chancel was added about 1895. North and west vestries were added in the twentieth century. 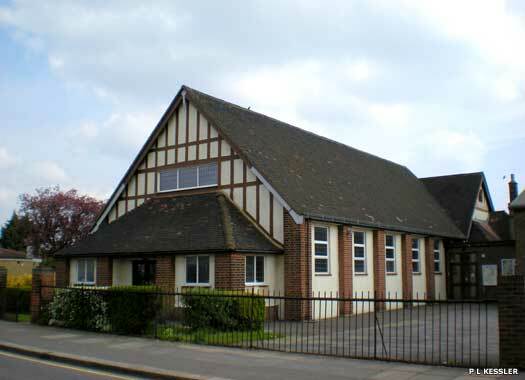 Barkingside United Methodist Church lies between Fairlop Road and Freemantle Road. It seems to have originated as a Wesleyan chapel, which in 1847 was on the east side of the High Street. This probably went over to the Wesleyan Reformers about 1850, and later joined the United Methodist Free Church. The building was enlarged in 1877, sold in 1937, and a new church built in Fremantle Road. The present church opened in 1959. The old building became the church hall. Barkingside (Dr Barnardo's) Children's Church is on the south-western side of Tanners Lane, part of the Dr Barnardo's Children's Home complex that occupies this whole section. The home was started as a girls village in 1876 by Thomas John Barnardo and his wife, Sara Louise. The church was built soon after and dedicated in April 1894 as a multi-denominational children's church. The complex closed in 1986 as a home for children, with the last person in care leaving in 1992. 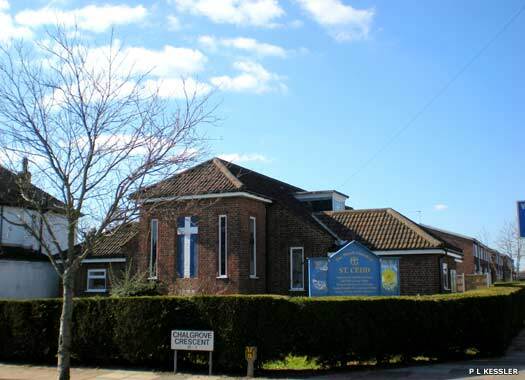 Clayhall Baptist Church is on the southern side of Harewood Drive, close to The Glade. It began about 1936 as Claybury Park Baptist Church, with meetings being held in a house on the Claybury Estate. A tent mission led to the opening of a Sunday school in the Peel Institute, Woodford Avenue. Help was provided by Ilford High Road Baptists, and in 1938 the present building was opened on land provided by the estate's builders. The church was formally constituted in 1940. The Parish Church of St Cedd is on the corner of Marston Road and Chalgrove Crescent. 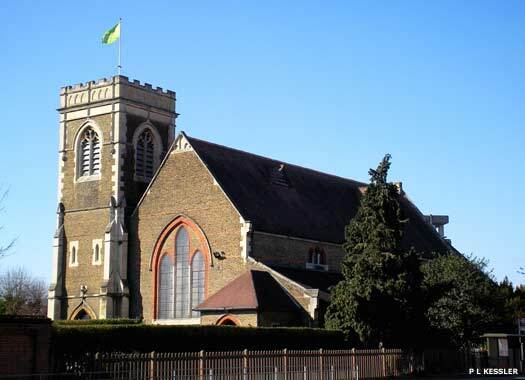 A parish was created in 1938 from parts of Holy Trinity, Barkingside, and Holy Trinity, South Woodford. 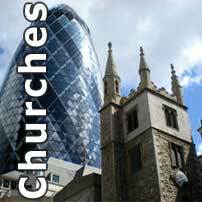 In the same year a church hall was built on the present site for use as a temporary church. In 1964 services were still held there and a new church, which had been planned to occupy the adjoining site, had not been started. That site is now occupied by housing. St John Vianney Catholic Church lies on the northern side of Stoneleigh Road behind a particularly tall green wire security fence. 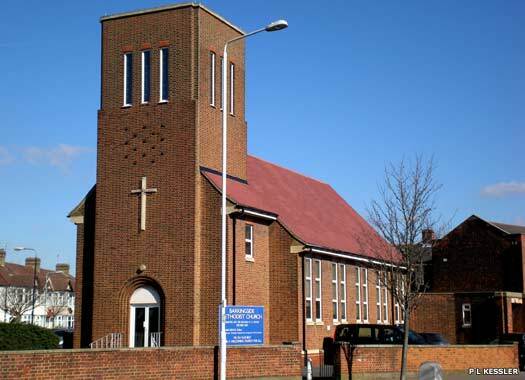 The church was founded in 1944 and is in the Clayhall parish which is part of the Redbridge deanery. The saint, John Mary Vianney, was born on 8 May 1786 in the small farming town of Dardilly, France. In 1818 he was appointed the Cure of the small faithless town of Ars in post-Revolutionary France, and served there for forty-one years. 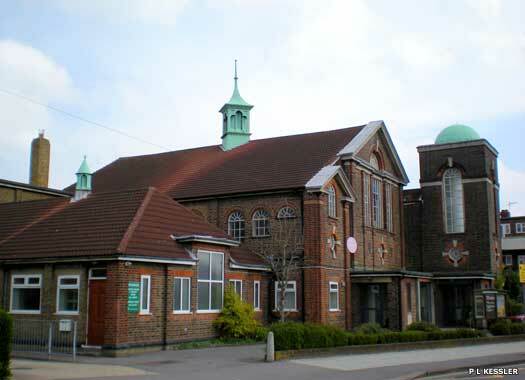 Gants Hill Methodist Church is on the north side of Gants Hill Crescent, close to Cranbrook Road. The church was opened in 1928, mainly at the expense of Joseph Rank. Leslie A Newman was appointed as minister in the same year and the church was immediately successful. The congregation was so large that it was sometimes necessary to display 'church full' notices outside. 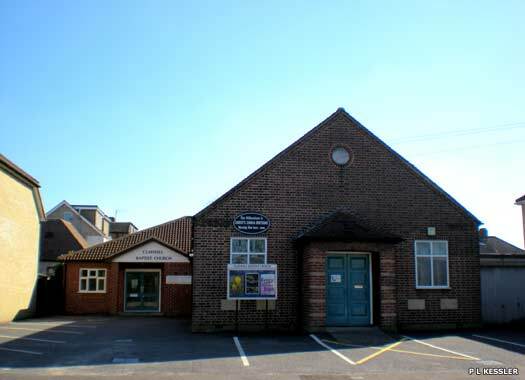 An integrated church hall was opened (nearest the camera) in 1935. 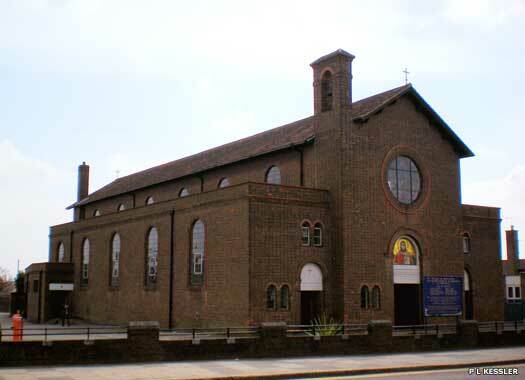 The Catholic Church of St Augustine of Canterbury is at the south-east corner of Cranbrook Road and Loudoun Avenue. A temporary church was opened on this site on 27 May 1928, when the first Mass was held. The present permanent building was completed in 1954 and consecrated on 29 April 1980. It was built in brownish-red brick in a simplified Italian Romanesque style, with a narthex, an aisled and clerestoried nave, and a shallow chancel flanked by chapels. 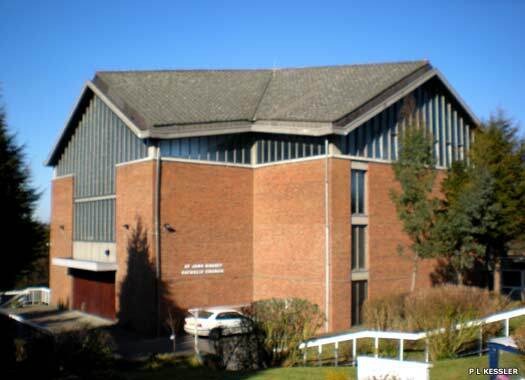 Ashurst Drive Baptist Church, Gants Hill is on the eastern side of Ashurst Drive, between Otley Drive and Headley Drive. It was built in 1929 to serve the rapidly-growing area north of Eastern Avenue. Commemoration stones were laid on 9 March 1929. Missionary work there had been fostered by the London Baptist Association, especially by its president, Frank Smith, minister of Ilford High Road Baptist Church. Local doctor Nathaniel Beattie was lay pastor for three years.